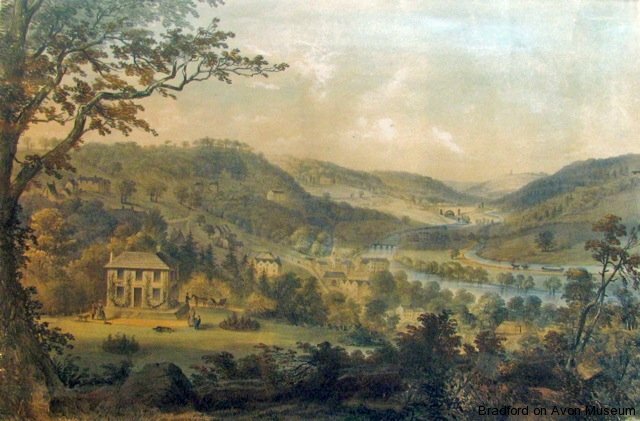 A lithograph made from a drawing or painting by Bradford artist Elizabeth Tackle in the late 1840s or early 1850s. Browne’s Folly tower, built in 1848, is visible in the distance, but the railway of 1857 was yet to be made. In the middle distance is the Kennet & Avon Canal’s Dundas Aqueduct. 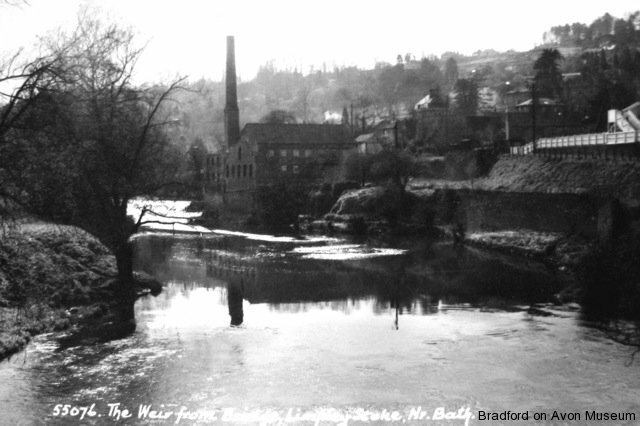 Nearer are Stokeford Bridge, the mill and houses of Lower Stoke. The house on the left, with out-of-scale people, is Stoke House. 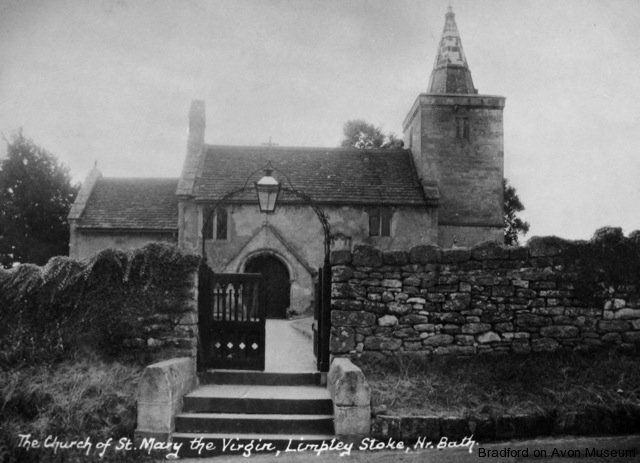 St Mary’s Church, Limpley Stoke. Very Little has changed in this view since it was taken in the middle of the 20th century. The light patches of stonework of the top section of the spire resulted from rebuilding after damage by lightning in 1952. A view over Middle Stoke with the Avon Valley in the background, looking east. On the left is the old National School of 1845, now the Village Hall and in the centre is the former Baptist Chapel of 1815. 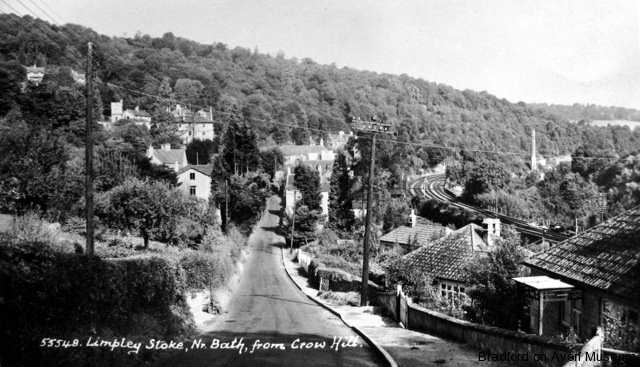 Another view over Middle Stoke. This one is looking in the other direction, to the north. The chapel is on the right and school in the centre. A closer view over the village and the Avon valley with the Dundas Aqueduct of the Kennet & Avon Canal in the background and Browne’s Folly tower on top of Farleigh Down in the distance. 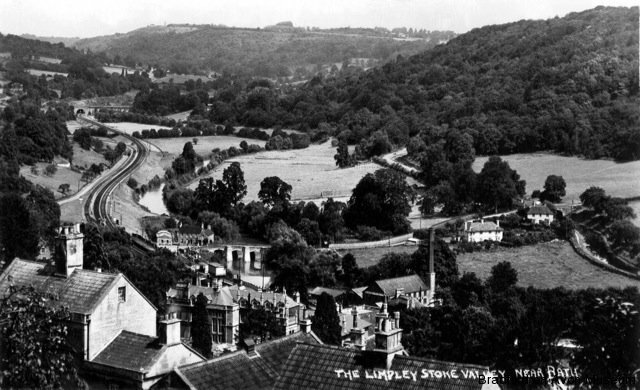 Also to be seen are the chimney of the mill, Stokeford Bridge, Limpley Stoke Hotel and the railway lines, with that of the Camerton branch curving off to the left. A view of Lower Stoke from Crow Hill, near the border with Freshford, looking to the north. 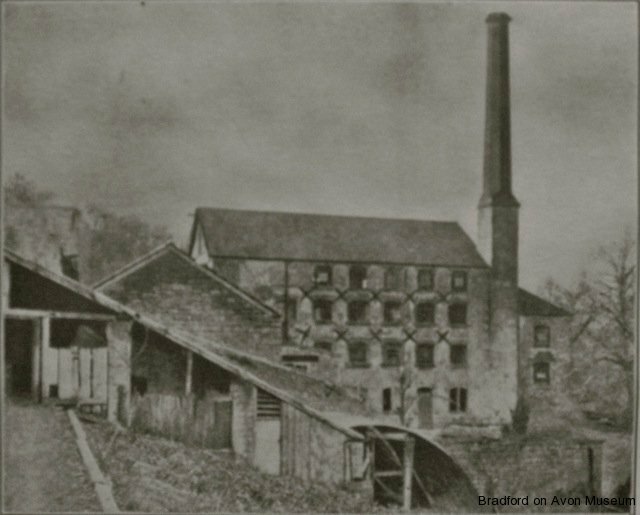 The chimney of the mill is on the right. Only the centre two tracks of the railway are running lines; the other two were sidings for coal trains coming from the collieries of Somerset. 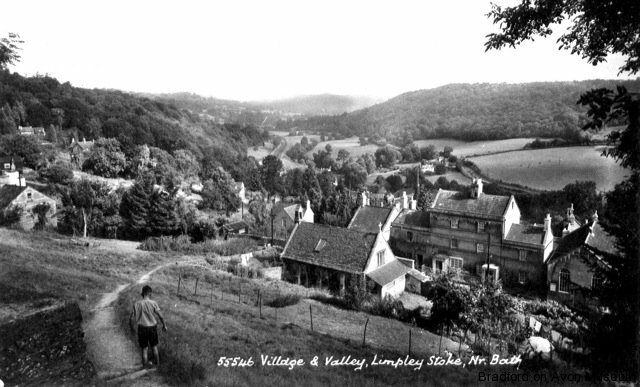 Limpley Stoke from Winsley Hill, on the other side of the Avon valley. 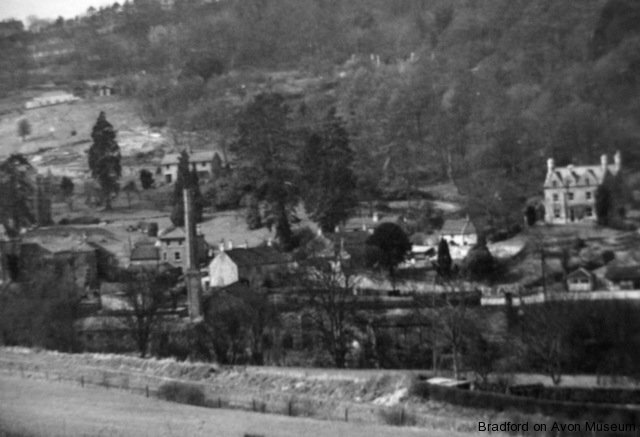 The chimney of the mill is prominent, as is the tower-like late Georgian Weir House in the centre and, behind it the Limpley Stoke Hotel. Much of the hillside is bare where are now more trees and houses. 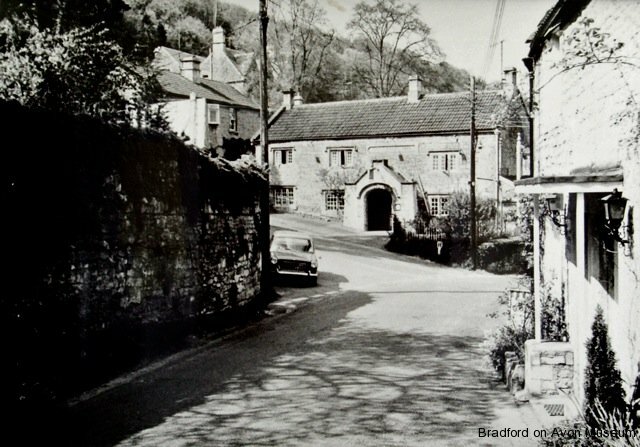 The Hop Pole Inn, in Lower Stoke, in the 1960s. It is little different today, except perhaps for the Austin-Morris 1100 car. 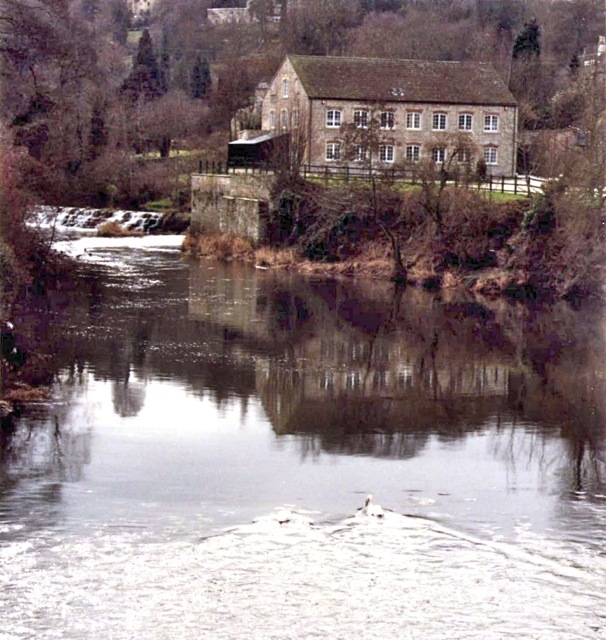 Limpley Stoke Mill and the weir, seen from Stokeford Bridge. On the extreme right is the footbridge of the former railway station. 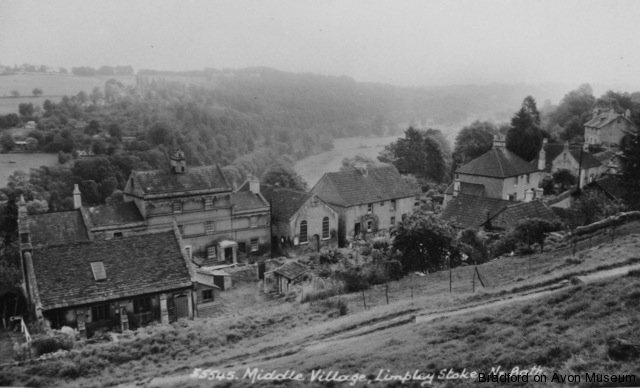 Limpley Stoke Mill from the same position in 1992. The chimney has gone, but the building has yet to be converted and extended into the office block of today. 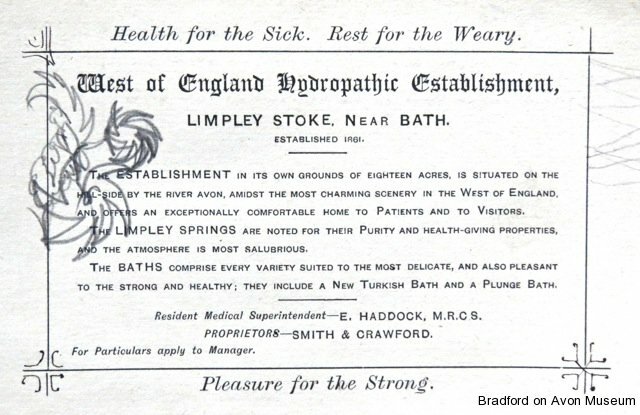 An advertising card for the Limpley Stoke Hydropathic Establishment (now the Limpley Stoke Hotel). Someone has done a pencil doodle on it.